In partnership with the Italian Ministry of Foreign Affairs and the Italian Chamber of Deputies, the Council of Europe organised a conference in Rome on 19 September in order to celebrate the entry into force of the Istanbul Convention, highlight its holistic approach to combating violence against women and encourage member States and other participating States to sign and ratify this ground-breaking convention. 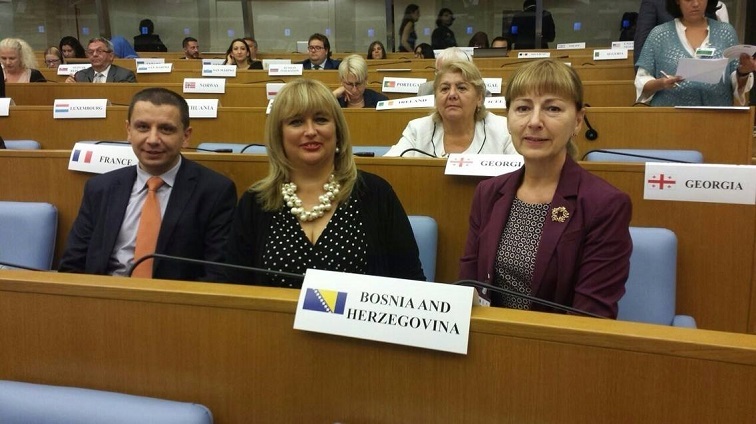 Delegation of Bosnia and Herzegovina participated in the plenary sessions of this Conference as one of the countries which has signed and ratified this landmark document. The Conference Safe from fear, safe from violence – celebrating the entry into force of the Istanbul Convention paid tribute to the important role of the Istanbul Convention in filling a gap in the protection of women from gender-based violence in Europe and beyond. Particular emphasis was placed on the added value of the Convention, the link between achieving gender equality and combating violence against women, as well as recognising violence against women as a serious human rights violation. In addition, the measures which States Parties to the Convention will be required to take in the area of prevention, protection and prosecution were presented in detail, as well as the need for holistic policies in this field. Finally, the Conference provided a platform for the exchange of experiences, knowhow and networking among participants. Participants included representatives from government structures and institutions at decision-making level, parliaments and local authorities from Council of Europe member states and beyond, other regional and international organisations, NGOs and civil society as well as media. On the occasion of the Conference, a Joint Declaration was delivered by Ministers and State Secretaries from State Parties to the Istanbul Convention to demonstrate political will to implement its provisions and to urge other Council of Europe member States, non-member States, as well as the European Union, to become Parties to the Convention.